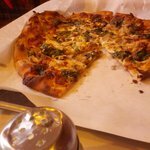 Excellent thin crust wood oven pizza. Having heard all the hype I was anxious to try this place. I would say this Pizza was really really good. We were driving throu and ordered take out pepperoni Pizza. The large which is huge(18-20”)! Easy on/ off rte 95. They said 40 min but it was done in 30. Everyone was pleasant. First the returant. There was a line to be seated but take out walks to the back to pick up. I was caught off guard by the non descript restraint. I did not expect a low key tradition pizza place. Nothing fancy. The pizza is served on large sheet pans. Now for the pizza, the crust is thin. It was burnt on the edges (expected) but the center was perfect and had great flavor. The cheese was just cheese nothing special or flavorful. The sauce has a subtle sweetness and the pepperoni gave the Pizza some much needed zip. I could see all kinds of great combinations being made. They cut the pizza in quarters then in odd shaped thin slices. 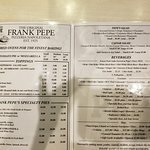 Yes, Frank Pepe is the BEST! 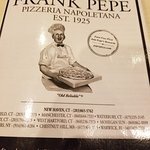 I'll start with this: Frank Pepe Pizza is the BEST!! No, its not crazy combinations of toppings one can get at other pizza places--it's just the BEST pizza ever. The dough, the sauce, the toppings---unmatched. There. I said it. THE SPOT is the little place behind the Frank Pepe larger restaurant. The pizza is the same. It's smaller, quieter and feels like home. I love how informal everything is here. If you want balsamic fig pizza, or barbecue chicken pizza...this isn't your thing. You'll be disappointed. 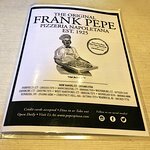 If you want the BEST pizza...Frank Pepe. After all the hype, I think I was expecting something amazing. Just pizza. Not extra good or particularly bad, just pizza. We had pepperoni and their roasted red peppers. Frankly, the red peppers were the best part of this pizza. We stood in line for about 40 minutes... I would not stand in line again for this pizza. 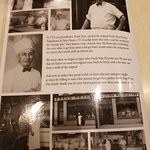 My son lives in New Haven and EVERY time I go out there to visit him, we have to go to Frank Pepe's Pizzeria. The food is always amazing. The pizza is served on a cookie sheet and is never perfectly round. Some edges may be burnt, but it always has an amazing taste. 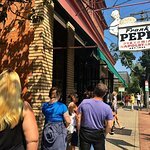 So, we heard all the noise about Frank Pepe's pizza--about how good it was and such. 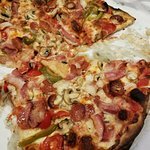 While we are not crazy about seafood on our pizza, and while we live in New Jersey where pizza is king, we really, really enjoyed our pie at Pepe's--including the left overs the next day! 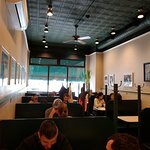 I will rate the Wooster St.Spot location a 5, not only because we loved the food, but also because the service was excellent and it was worth the 30 minute wait to get a table. Instead of the White Clam Pizza, we ordered our favorite sausage and peppers along with two salads and some red wine. This pizza could compete in Jersey. Ours' was made just right--with a thin crust just crunchy enough, but didn't break the teeth. The ingredients was a fresh as you'll find anywhere--probably because their through put is huge. Next time in New Haven (or any other town with a Pepe's) we will stop for another pie! 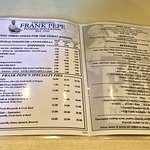 Been to The Spot, Frank Pepe Pizzeria? Share your experiences!